The Grand Synagogue of Edirne in northwest Turkey hosted its first wedding ceremony in 41 years on May 29. In all probability, the "peace" between Turkey and Israel will look like the definition of peace in Ambrose Bierce's The Devil's Dictionary: "In international affairs, a period of cheating between two periods of fighting" -- despite the backdrop for peace looking incredibly (but mischievously) convenient. If Ankara and Jerusalem finally shake hands, it will be because Turkey feels isolated internationally. On May 29, a Jewish wedding ceremony was held in a historical synagogue in the northwestern province of Edirne for the first time in 41 years. A few months before that, in December, the Jewish year 5776 went down in history possibly as the first time in which a public Hanukkah candle-lighting ceremony was held in Muslim Turkey in a state-sponsored event. All that is nice -- but can be misleading. In a powerful article from this month, Jonathan Schanzer forcefully reminded the world that although Saleh Arouri, a senior Hamas military leader, was expelled from his safe base in Istanbul, "... many other senior Hamas officials remain there. And their ejection from Turkey appears to be at the heart of Israel's demands as rapprochement talks near completion." Schanzer says that there are ten Hamas figures currently believed to be enjoying refuge in Turkey, and he names half a dozen or so Hamas militants there, including Mahmoud Attoun, who was found guilty of the kidnapping and murder of a 29-year-old Israeli. Also enjoying safe haven in Turkey are three members of the Izzedine al-Qassam brigades. Schanzer adds that "there are a handful more that can be easily identified in the Arabic and Turkish press, and nearly all of them maintain profiles on Facebook and Twitter, where they regularly post updates on their lives in Turkey." 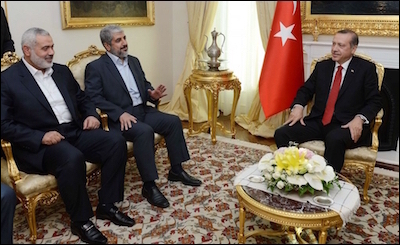 Turkish President (then Prime Minister) Recep Tayyip Erdogan (right) meeting with Hamas leaders Khaled Mashaal (center) and Ismail Haniyeh in June 2013. Turkish President Recep Tayyip Erdogan has claimed more than once that Hamas is not a terrorist group but a legitimate political party. He has held innumerable meetings with senior Hamas officials including Khaled Mashaal, head of its political bureau. In addition, Erdogan came up with the idea that Zionism should be declared a "crime against humanity." Anti-Semitism, as mentioned, is the other problem. Erdogan deliberately spread anti-Semitic sentiments to an already xenophobic society until he decided to go (relatively) silent when he recently realized that Turkey's cold war with Israel was not sustainable. This does not mean that his or Turkish society's views regarding Jews have changed. Earlier this year, for instance, one of Erdogan's chief advisors appeared in pro-government media to attack political rivals as "raising soldiers for the Jews." This sentiment is not confined to government big guns. There was more. Turks happily expressed their feelings in social media to "celebrate" the Jewish wedding. "One of my biggest dreams is to kill a Jew," wrote one Twitter user. "[Hitler] did not do it in vain," wrote another. The Hitler series went on with "He was a great man," "Where are you Hitler?" and "We are all Hitler." This is the backstage scene in the country where a Jewish couple happily married at a synagogue for the first time in 41 years -- the same country supposedly to "normalize" its ties with Israel.